Neal Fraser’s long-awaited restaurant housed in the former rectory of the old St. Vibiana’s cathedral officially opened this week. Fraser’s ambitious multicultural roster of dishes includes a riff on pozole with crisp pork belly and chiles, spot prawns with sea urchin and wasabi “snow,” Delicata squash salad with feta and hazelnuts, and a Thai-style Dungeness crab soup. Inside an unmarked space inside Koreatown’s recently refurbished Normandie Hotel is the new (and permanent) home of Gary Menes long-running pop-up, Le Comptoir, which serves a vegetable-centric menu to 10 guests at an intimate kitchen-side counter. 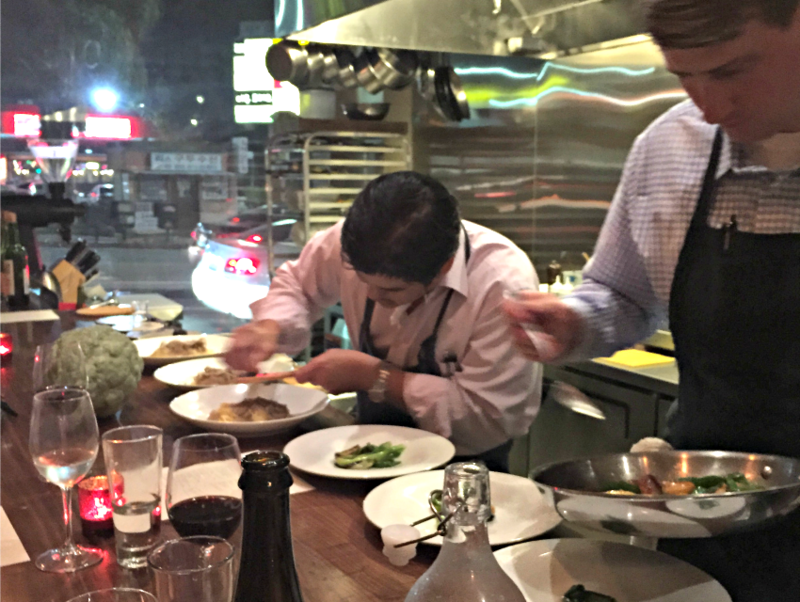 Much of the produce is sourced from Menes’ farm in Long Beach, allowing diners to taste the ultimate in farm-to-counter cooking. Chef/charcuterie master Kris Morningstar’s California comfort food, including dishes like veal meatballs, agnolotti with truffled rice filling, and a choucroute garnie with sausage, pork loin, crispy jowl, shank, and house-made sauerkraut, is the primary attraction here. But the stunning patio, and the wine, cocktails, and hospitality from a team led by Stephane Bombet and Francois Renaud all help create what Morningstar calls a “total-package” restaurant. Fans of the Portland-based Thai food empire that is Pok Pok have reason to celebrate. Chef Andy Ricker and his crew are slinging wok-fried plates of pad thai and other street-style stir-fry dishes inside Chinatown’s Far East Plaza. The quick-serve concept will keep hungry crowds busy while the larger, main branch of Pok Pok L.A. opens further north in Chinatown. In the meantime, try the Stumptown Thai-style iced coffee, or one of the tangy drinking vinegars. After opening several restaurants in Eastern SGV, chef Ricardo Diaz (Colonia Taco Lounge, Bizarra Capital) has finally brought his food to the Westside with this upscale taqueria and mezcal bar in Santa Monica. Sip cocktails made with bubble gum-infused mezcal and enjoy tacos featuring dry-aged chorizo and farmer’s cheese, duck confit tamales, or a chicharron quesadilla lined with queso Oaxaca. Koreatown’s historic burger counter, which first opened in 1948, has been reborn at the newly refurbished Hotel Normandie. Chef Christian Page (Short Order) is serving house-ground, grass-fed burgers broiled on an old-fashioned griddle, along with classic diner fare like patty melts, hotcakes, and frozen custard, plus a selection of beer and cocktails from the bar for late-nighters. But as with the O.G. Cassell’s, there aren’t any french fries on the premise, only big scoops of potato salad served on the side. Former Patina chef Brad Thompson’s new coastal-inspired restaurant might be the most exciting thing to happen to Downtown’s fine dining Mexican scene since Border Grill. Serving Baja-style crispy fish, ceviches, and pambazos—plus a killer agave spirit-based cocktail program—Pez Cantina hopes to promise Downtowners a breezy and relaxed place to enjoy a few tacos and some drinks. The newest dining option to hit Echo Park is the type of crowd-pleasing American bistro neighborhood residents have long pined for. Stop in for a glass of rose or IPA, then share entrees like grilled salmon with beurre blanc or a hearty braised beef potpie made with Stilton and fennel. Shareable options like flatbreads and chicken liver mousse make this spot ideal for a light snack, too. The latest stylish space to hit Santa Monica is Aestus, a mid-century modern restaurant helmed by former Royce chef Alex Ageneau. On the menu are seasonal dishes like fried smelt with crudites, a house-made charcuterie board, grass-fed beef with sunchokes, and a fire-roasted half chicken. Cocktails are available, but don’t neglect the wine list, curated by the co-founder of Santa Rosa winery Lioco. New Orleans is so hot right now: Case in point, the Historic Core’s new Big Easy-themed bar and restaurant, which pairs moonshine daiquiris (served from a slushie machine) with high-minded NOLA fare like smoked shrimp beignets and seafood-and-sausage steam pots. Located in the former Parish space, the old-timey decor of the building helps nail down the Bourbon Street feel even further.